Traditional Chinese medicine is an ancient form of medicine. Based on particular oriental views, it has developed its own unique set of theories, diagnosis and treatment. Generally, physicians gather health information by special examination techniques; the information is then interpreted to make a diagnosis according to TCM principles about physiology and pathology. Then appropriate therapies are selected and used in accordance with these TCM principles. These procedures are the only way to employ TCM therapies for optimal efficacy. Due to the rapid and uncontrollable growth of cancer cells, normal tissues and functions are affected progressively, so cancer patients are always in a state of exhaustion and debility. From a TCM perspective, cancer begins to affect the qi in the early stages, and then further consumes the yin and the blood. When primordial energy begins to become exhausted, that means the body's qi, blood yin and yang are almost depleted. In TCM theory, changes in either blood or qi affect all parts of the body in different degrees. They are the source of body activity and movement as well as the functions of different organs. When the smooth flows of blood and qi are disturbed by certain factors and remain for a long time, the stagnated qi and blood will lead to pathological stagnation which can easily induce cancerous changes. There is a saying in TCM that "when there are masses inside the body, they are usually due to phlegm accumulation." 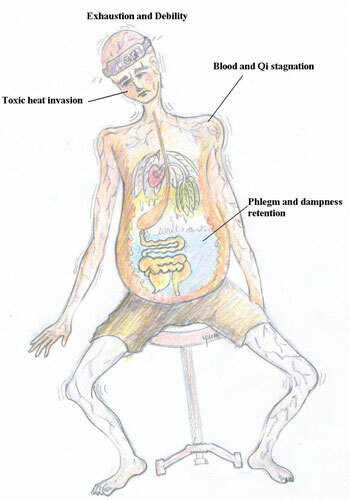 Both phlegm and dampness are the pathological waste products from organ dysfunctions, and are mostly attributed to disharmony in fluid metabolism. Under normal circumstances, fluid metabolism is controlled by organs like the lungs, spleen, kidneys, and triple burner. When these organs are affected by the six evils, diet or the seven emotions, they under-function, and the body fluids will not be distributed properly, which in turn lead to the retention of dampness evils and phlegm. Phlegm and dampness have sticky and turbid properties and are likely to cause obstructions. Fever is quite common in cancer patients. According to TCM understanding, this is mainly due to irritation by toxic heat evils. Actually, toxic heat evils are the end products of various kinds of pathological waste that had accumulated inside the body during the progression of the cancer. These highly invasive pathogens in turn directly or indirectly attack the normal tissue or organs, and also promote cancer cells to grow and spread. Apart from the above pathological analysis, modern TCM physicians also rely on conventional methods to provide specific detail on cancerous changes, as TCM does not use cellular and biochemical tests for detection.